It’s believed the first Greek to set foot on American soil – in what is now Pensacola, Florida – was a sailor named Don Teodoro who accompanied Spanish explorer Panfilo de Narvaez in 1528. In the 1700s, around 450 Greek colonists founded New Smyrna near Saint Augustine, Florida. But it was not until the late 19th and early 20th centuries, with the arrival of hundreds of thousands of immigrants and refugees from across Europe, that Greeks began to settle here in great numbers – in New Hampshire, in Massachusetts, in Pennsylvania, as well as in Michigan, Wisconsin, Ohio, Illinois and beyond. 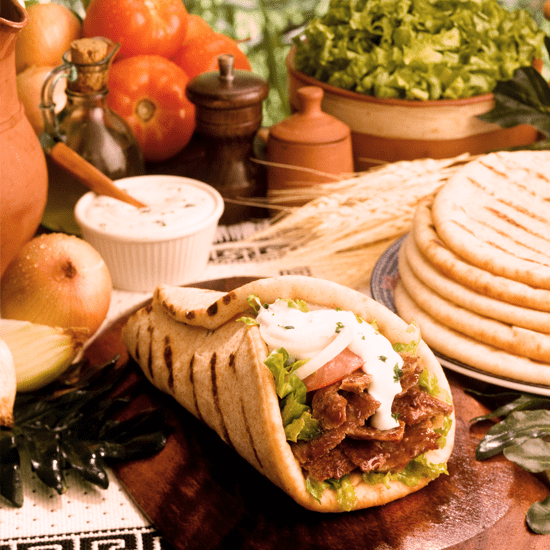 Souvlaki and gyros: Maybe America’s favorite Greek dish, these mouthwatering wraps center on succulent chunks of skewered pork, beef or chicken, with chopped tomatoes, onions, potatoes and tzatziki sauce on pita bread, and usually include a classic Greek salad with feta cheese. Dolmades: Another mainstay across the Mediterranean and Middle East, these baked vine leaf rolls, are stuffed with minced meat and rice or pine nuts. Other hollowed out vegetables — like tomatoes, peppers and squash – are also often used. Taramasalata: A simple but satisfying appetizer dip that consists of pink or white fish roe, with potato or bread, olive oil and lemon. Saganaki: Essentially it’s fried cheese, often mixed with shrimp or mussels. Saganaki derives its name from ‘sagani’, a frying pan with two handles whose name, in turn, originates from Turkish and, before that, Arabic words. Spanakopita:A traditional spinach and feta cheese pie wrapped in paper thin and crunchy phyllo dough. Use a cheese-egg mixture for the filling and it’s called tyropita. Amygdalota: A wildly popular almond cookie that’s savored with a cup of Greek coffee – or ellinikos. Baklava: Although most associated with Greece, baklava is another Mediterranean and Middle Eastern mainstay consisting of nuts, butter and sweet syrup surrounded by crispy phyllo. What are your favorite Greek dishes or the ones you’re dying to try? Share your food ideas and experiences with the Shop Talk blog forum now!